When I blogged yesterday about the strengths of the Mail Online's comment voting system, I steered clear of comment on the subject matter being voted on. It seemed to me that there were enough people pontificating on the Carol Thatcher / One Show issue, so why should I add anything to the cacophony? However, yesterday I changed my mind. "Unless you have been spat at, kicked or had eggs thrown at you, all while being called that hateful term, it is unlikely you will ever understand why a small doll causes such a big fuss. Whether it's bullies, thugs, or grown-up TV presenters who should know better, every time I hear the word I flinch, it's like I'm back in the playground all over again, fending off the punches." "The BBC, so full of noisy solicitude for the feelings of ethnic groups, is acting like a plantation owner, guarding the blacks with an aggressive, proprietorial air." The Mail also ran a piece from Melanie Phillips. I have to say I was totally perplexed. 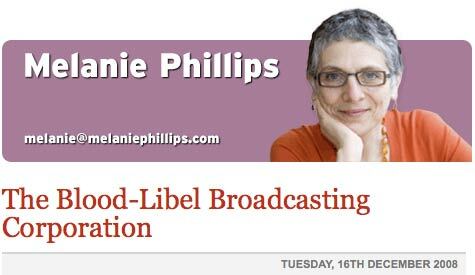 In recent weeks on her Spectator blog, Melanie Philips has accused the BBC and other Western media outlets of perpetuating the blood libel against the jewish people. "Does that mean therefore that any BBC employee who makes an injudicious remark to a group of colleagues anywhere in the building – in the newsroom, in the lift, in the loo even – can expect to find themselves snitched upon to the BBC commissariat and have their employment summarily terminated forthwith? No-one ‘leaked’ Carol’s remark, sniffed Ms Hunt, since she had made it in front of people. Again, she spectacularly missed the point. One of the colleagues with whom Carol was relaxing went and informed upon her to the BBC authorities for saying something he or she decided was a forbidden expression. That is despicable." So, does Melanie Phillips therefore think that if a BBC employee or guest said in a 'Green room' or Television Centre lift that they hoped Iran 'wiped Israel off the map', the other people in the lift should just look at their shoes and consider it a private moment? I can't imagine that she would look as favourably on casual anti-semitism in the workplace as she does on the use of the word golliwog. "You know, I don't think she should have been fired. The way to deal with it is ... you take that person on one side and say, 'Listen you've got to watch what you say and you've got to be sensitive'"
In August last year Johnson accepted the Olympic flag on behalf of London. 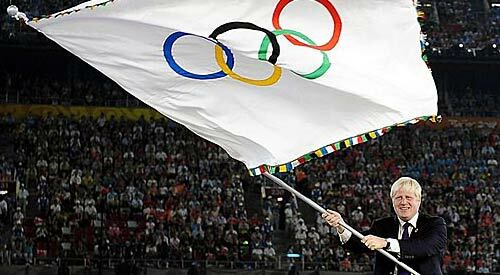 The Olympics might often be a focus for political dissent, but they also allow people of all states, creeds, faiths and colours to participate. Sadly, yesterday, Boris Johnson came out to say that as far as he is concerned, Londoners will be perfectly entitled during 2012 in the workplace to compare any black-skinned athletes at the games to golliwogs, just as Carol Thatcher did to a tennis player, as long as afterwards they are taken to one side and told to be a bit more 'sensitive'. By Martin Belam on 7 February 2009. It's been a strange week, hasn't it? Theresa May on Question Time and James Forsyth in The Spectator have both responded to Carol Thatcher's behaviour with measured understanding of why she is no longer working on the programme. Still, at least you can rely on the Mail to not surprise you by being able to think through its reactions. "I do not for one minute believe that this election shows that London has been transformed in to a Conservative city but I do hope it does show that the Conservatives have changed in to a party that can again be trusted after 30 years with the greatest, most cosmopolitan, most multi-cultural city on earth. I will work flat out to earn your trust and dispel some of the myths. I will work flat out to repay your confidence." Does it matter what Boris thinks? racism is a serious matter and such comments from Mayor won't help.